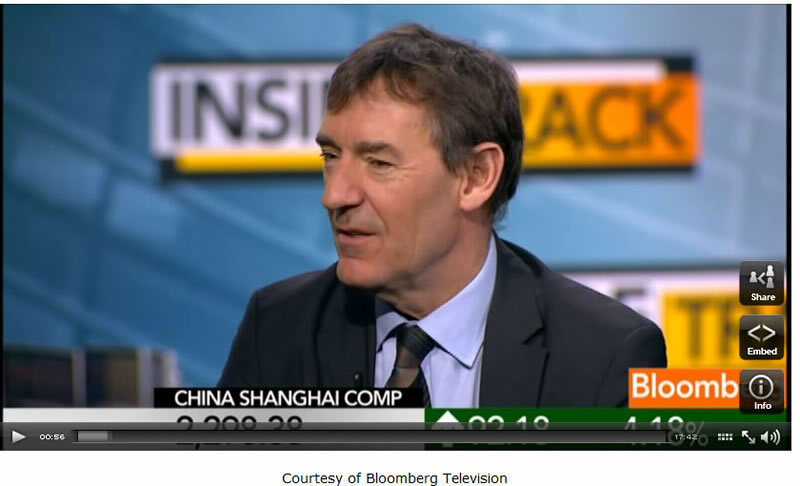 Jim O'Neill, chairman of Goldman Sachs Asset Management, spoke to Bloomberg Television's Erik Schatzker and Stephanie Ruhle about the Chinese economy and crisis in Europe. O'Neill said that China's continued growth is "the most important thing in the world." On potential Greek default, he said that "China creates the equivalent of another new Greek economy every four months" and "Greece itself is not that important." "It's a bit stronger than I thought as well, actually. It is a bit of a blow for the hard landing guys, given inflation has come down so much as well. And policy makers are moving away from restraints and flirting with some sort of stimulus. If I was a hard landing guy, I would not be feeling very excited this morning." "Let me put it in the context of a bigger picture. I am assuming this decade China grows by 7.5%. Translated into dollars, if they do that 7.5%, China will contribute in dollar terms more than the U.S. and Europe put together this decade. And it's higher in that. So it's the most important thing in the world, is what I'm trying to say." "All of the concerns that many people have expressed are pretty important issues to consider. There are lots of challenges, as there frequently are with China, but the thing that generally impresses me is that Chinese policymakers themselves do not shy away from acknowledging that many of these things are issues, and they try to deal with them. The big one is the property issue. Something that many people in the West, particularly in the U.S. misunderstand about this--it is not like the U.K. or U.S. bubble bursting. Chinese property prices have turned because the Chinese authorities have deliberately stop them from going up. That should have been what the Fed should have done in 2005 and 2006 and maybe before that, but it is tough in a democracy. That is why you get the wild housing bubbles in many Western economies...In China's case, they are doing it deliberately to stop a bubble. I think a fundamental point is people got the approach wrong about that topic." "With the growth of technology, as we of seen throughout the Middle East last year, it is such a challenge for anyone to control anything with this media. So that is definitely amongst the bigger picture issues one has to be really thoughtful about. I would imagine that some democracy a la Chinese style will emerge. It's not going to be one that we embrace and bless. Importantly, from everything I have understood from going there for 20 years, the Chinese do not crave the exact form of democracy that we have and think they should have. They want more freedom and really want more wealth. If the Chinese authorities continue to provide that and it spreads, then I think generally speaking, the Chinese people will be happy. A key part of what is going on right now, they are deliberately raising wages significantly, which is much ignored in the discussion of the exchange rate." "China creates the equivalent of another new Greek economy every four months. Greece itself is not that important. What is important about the European mess is Italy. How Greece deals with this restructuring or default, which seems quite possible, and the contagion of that through the rest of Europe, it is extremely important. Who knows with this European stuff, it is a different issue every day. It is very interesting to see the mood of the markets post this downgrade at the weekend. Three months ago the European markets would have traded poorly yesterday and today. But they've short of shrugged it off. Whether that is because people perceive the ECB will do more and more or whether there is some signs of stabilizing of the economy." "Ultimately I think the euro is more likely to go below 1.20 than above 1.40. But here, I think it's not worth the energy most people spend on it. I think the yen is more interesting, the Swiss franc, the stock market, and some bond markets....Europe hasn't generated domestic growth that has driven the world for the 30 years of my career - with the odd exception of Spain for a couple of years. A lot of the earnings depend on the rest of the world. So many European equities can perform really well. The German stock market, I think of it as a developed BRIC. German companies are getting enormous growth out of what's going on in China. So it's not all just about sovereign debt for European equities." 18 Jan 12, 11:03 CHINA ECONMIC GROWTH FAR FROM..
HOW MANY GREECES DOES IT TAKE TO SWITCH OFF A CHINESE LIGHTBULB?